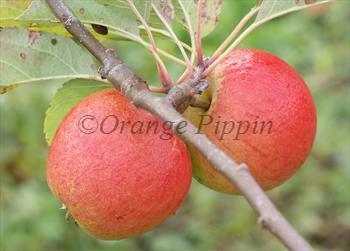 Lord Lambourne was introduced in 1907 and is very much in the tradition of classic English high-quality dessert apples. It has the pleasing uniform shape - round, and not too flattened - and typical orange flush over green, with a hint of russet. On biting into a Lord Lambourne the first thing that strikes you is the juice and acidity. The flesh is creamy-white and quite crisp, and the flavour is pleasantly strong. Although a mid-season variety, Lord Lambourne has some of the aromatic flavours of later-ripening English aromatic varieties making it a useful variety to grow to fill the gap between early and later varieties. Please fill in the details below and we will let you know when Lord Lambourne apple trees are back in stock. Lord Lambourne is in flowering group 2. Lord Lambourne is partially self-fertile, but fruiting will be improved if there is a compatible tree of a different variety nearby. Lord Lambourne is easy to grow, and should crop reliably in most UK situations. It is a good choice for growers in areas of high rainfall, and wherever it is grown it usually produces good clean disease-free apples. Introduced in 1907, a cross between James Grieve and Worcester Pearmain.